The versatile five-door subcompact Honda Fit has been significantly upgraded for the 2018 model year including sportier styling, an improved driving experience, a new Sport trim level, and a significant increase in technology features. These add to the already best-in-class combination of passenger space, fuel efficiency, sophistication, practicality, and affordability that the 2018 Honda Fit offers. One such new feature is Honda Sensing. This group of advanced safety technologies include Collision Mitigation Braking and Road Departure Mitigation and is available on all Fit models and standard at the EX trim level and above. With its sportier styling the 2018 Honda Fit presents a lower and wider appearance because of its new front- and rear-end styling. In addition the 2018 Fit features a more sophisticated chrome and black grille, as well as new wheel finishes. Honda is offering two new color options for the 2018 Fit: Helios Yellow and Orange Fury. These new colors are in addition to the currently available White Orchid Pearl, Lunar Silver Metallic, Modern Steel Metallic, Crystal Black Pearl, Milano Red and Aegean Blue Metallic. For 2018, the Fit is offered in LX, the new Sport, EX, and EX-L versions. Standard features on all Fit models include rearview camera, tailgate spoiler, auto on-off headlights, LED brake lights, Bluetooth HandsFreeLink and a center storage console with armrest. All 2018 Fit models feature a redesigned instrument cluster with a large analog speedometer and digital tachometer. Models equipped with Honda Sensing safety technologies receive a 4.2-inch color display from which the driver can select different types of information including available turn-by-turn directions. 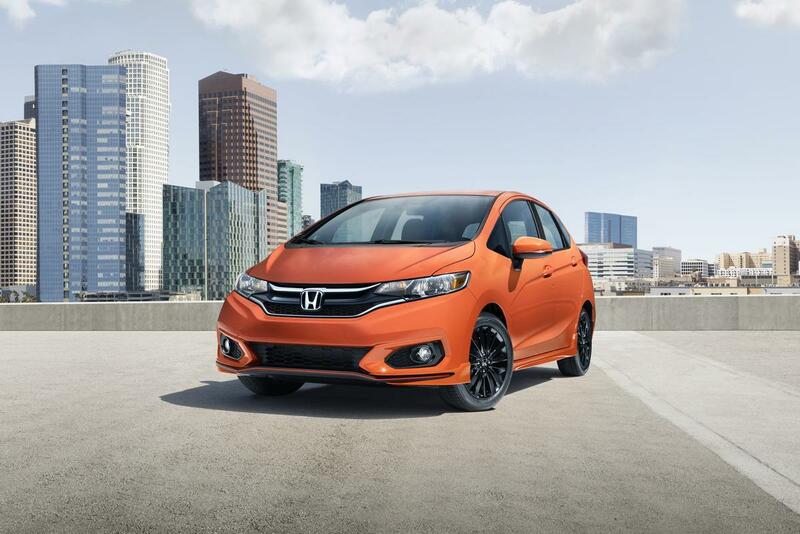 The Fit Sport is based on the LX model, but adds an aggressive front spoiler and rear diffuser, bright orange pin-striping, 16-inch aluminum alloy wheels with gloss-black finish, and chrome exhaust tips. On the inside the 2018 Fit Sport features an exclusive black interior with unique cross-hatched fabric for the seats and door trim. The exterior's orange accent theme continues inside with bright orange stitching on the seats, console-mounted armrest, and leather-wrapped steering wheel and shift knob. The Sport model also receives premium features normally found in the upscale EX models including a 180-watt six-speaker sound system controlled through a seven-inch touchscreen display compatible with Apple CarPlay and Android Auto formats. The 2018 Fit is powered by Honda’s proven 1.5L DOHC direct-injected four-cylinder i-VTEC engine with Variable Cam Timing. The engine delivers 130 horsepower and can be mated to either a six-speed manual or an efficient Continuously Variable Transmission (CVT) with G-Shift Control, availability depending upon model. Along with its responsiveness and performance, the 2018 Honda Fit also provides the driver and passenger with a long list of standard active and passive safety features. These include Vehicle Stability Assist with traction control, driver and passenger front and side curtain airbags with rollover sensors, Electronic Brake Distribution, Brake Assist, all attached to Honda's next-generation Advanced Compatibility Engineering body structure. With its package of safety features the 2018 Honda Fit is an affordable car in America with such a comprehensive offering of safety and driver-assistive features as well as the only vehicle within its segment. Add to that the traditional Honda values of build quality, responsive performance, and outstanding handling characteristics, and it’s a must-drive for shoppers looking at subcompact cars. The best way to evaluate the Fit is to drive on. So whether you live in Montgomeryville, Langhorne, Allentown or anywhere else in the Philadelphia area come into JF Freed Honda in Montgomeryville, let their expert sales team take you through the features and options and then send you out on a test drive.